In terms of losing weight, there are two major ways that EVERYONE talks about (diet and exercise) and one way that most people who live in “blue zones” stay lean. Blue zones are places across the globe that are known for their high rates of centurians, aka, they’re known for their higher than average rates of 100 year olds. What separates these places from other places? Researchers have identified 9 main factors, ranging from eating a more natural diet (the first rule here) to identifying a larger purpose in their lives. What’s more though, is that these places are known for their low levels of planned exercise. In other words, the people that live in these places don’t actively lift weights or run marathons. Basically, what the study on these individuals show is that some of the longest lived individuals in the world, don’t exercise. Planned exercise, such as strength training and daily jogs, does not mean that these people don’t move though. In fact, the people in these “zones” may not plan their “exercise” in the strictest sense of the word, but they move often. They take daily walks and typically their day-to-day activities has them moving more than most people do at a 9-5 job. The term for this movement is called NEAT (Non-Exercise Activity Thermogenesis). In other words, it’s the heat (calories burned) during everyday activities. An example of this is when someone goes on vacation, eats like “crap” and yet comes back weighing less than when they went on vacation. Why is this and what’s going on? Very simply, they’re on their feet, walking around for hours on end as opposed to sitting on their behinds for hours on end. What research has shown between lean and obese individuals, the obese individuals sit on average for 2 hours and 45 minutes more per day than the lean individuals. This amounts to an extra 350 calories per day burned by the lean individuals. In purely caloric terms, that totals about 1 pound of fat every 10 days or 36 pounds of fat gained by the obese individuals per year. Obviously, there are other mechanisms in place that don’t allow people to gain 36 pounds per year, every single year. The bottom line though is that everyday movements can add up to a significant amount of extra calories, every single day. 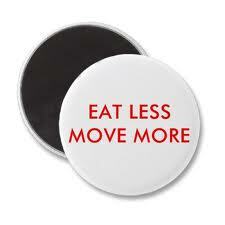 In trying to lose fat, every little bit counts and this includes simply moving more. Thus far with the Ultimate Physique Rules, I’ve talked about eating only, natural whole foods, strength training, controlling your caloric intake and breaking down those calories into smarter methods in order to lose fat. With this 5th step of simply moving more, whether through planned exercise or simply walking more, you have a solid foundation of losing 90-95% of all of the fat that you will ever lose. So what are some methods that you can implement immediately to move more? 1 – You can park further away, not only at work, but every single time you go shopping. 2 – You can get up from your chair every 20-30 minutes. 3 – You can take the stairs. 4 – You can take a daily walk. Personally, this is my favorite way. A daily walk doesn’t have to be planned, but you can get it in by walking to things you would normally drive to. Also, a daily walk with nice weather makes it so much easier in the warmer months. This is true no matter if you have kids or how busy you are, as you don’t need any special equipment. You don’t need super sneakers or “special” workout clothes (although you can do it after a strength training workout), in order to take that daily walk. That daily walk can and will help build momentum to keep you moving more, in a more structured exercise program. In other words, move more – every day!